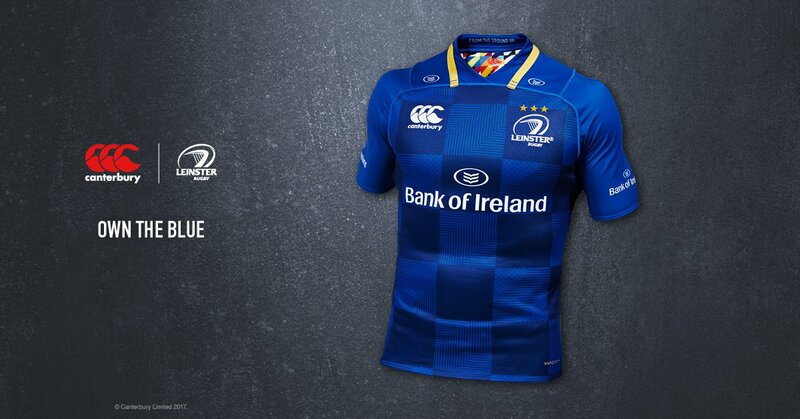 Canterbury and Leinster Rugby have revealed the new 2017/18 home kit ahead of the upcoming season. Marking a return to the classic Leinster blue, with a contemporary and functional twist, the new jersey is available to supporters on Canterbury.com and sports retailers nationwide from Tuesday, 8 August, 2017. Leinster Rugby will wear the new kit the first time in the clash against Gloucester Rugby at St Mary’s RFC on Friday, 18 August, 2017. Building on the club motto, the new jersey focuses on the heritage of Leinster Rugby, and the desire to build a team ‘from the ground up’. The inside of the jersey carries an insignia of clubs and schools from the province, representing the success, and the future of Leinster Rugby within Ireland. For the first time ever, each jersey will carry a unique identification number that links the supporter to the club. Designed in consultation with Leinster Rugby management, players and supporters, the new home jersey’s classic blue colour scheme and subtle chequered pattern is striking in its simplicity and a contemporary tribute to the most iconic Leinster home jerseys through the years. Evade technology, which disguises a player’s hip movement by raising the opposition’s line of sight, effortlessly compliments the patterned design. Hidden beneath the jersey’s exterior is the most technically advanced fabric ever worn by the team. Combined with a new neckline, the strip is lighter, stronger and features enhanced cooling and moisture wicking technology.